To cut costs, a job needs to be standard and be aimed at standard workers, so that recruiters can look for candidates using keywords and quick screening methods. As one job ad attracts huge number of responses, standardisation means less time is spent on filtering. As a consequence, the role of recruiters is reduced to simple clerical work, which is the code for it-can-be-automated. Unrabble.com does exactly that: take the pain out of recruitment process into the pleasure of ticking online boxes. Recruiting now is fun. Or, is it? Like many fresh innovative and promising start-ups the solution looks really good. The data entry screens, the filtering algorithms, the graphs & charts are bliss. It’s a pleasure! You have evaluation tools, collaboration tools and productivity tools. You have everything. Unrabble looks really great. It is online, it’s clean and it is clear. The problem starts when it comes to translation. Not to be too negative, but this is a bit like the Heidelberg theory of uncertainty which says that you cannot measure simultaneously space and time with precision. The equivalent theory of recruitment uncertainty is that you could not simultaneously be precise about activities and personal skills in the same time. If you focus on activities using exact measures, then you lose clarity about what the real skills are. If you focus on personal skills, you lose clarity on activities, which is the problem with resumes that have “fluffy” narrative. Personal skills could be described by putting together activities and outcomes presented in a certain light. Same activities could determine the formation of multiple skills. By using precise time based descriptors, only one picture can emerge, which is eventually quite inaccurate impression of who you are, or what you can do. 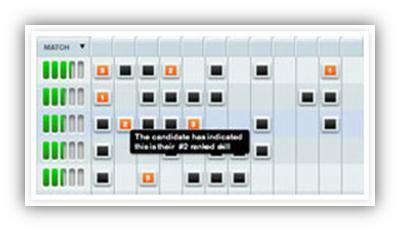 This prevents the candidates from highlighting the skills used during the experience that are relevant to the job. I mentioned in a previous post that employers are increasingly looking at prospective employees as actors joining a crew in a movie set. How will Unrabble help employers recruit the people that really fit with their business culture and work style? It seems that we are induced to cultivate a set of standard quantifiable skills that could be easily employed in freelance/crowdsourcing model, in which project teams are assembled based on these quantifiable skills. We are becoming virtual characters with digital attributes, measured, manipulated and moved around in a huge real-life Moneyball movie set. The ugly side of crowdsourcing is that we become numbers. The good news is that this is not the whole story. Innovation needs creativity and creativity needs human skills that are hard to quantify, free flowing individual expression, knowledge and intuition, and human relatedness that are essential in creating great teams. If I had a crystal ball, and I was a good reader, I would say the future employment is a combination of the two. We will need to be able to find short term opportunities for which our skills are a perfect match and which are discoverable over Internet using standard definitions and indicators, but we also need to explore opportunities based on personal relationships in which we work as part of a team creating new products in a start-up style. This may lead to the creation of other jobs, and if the venture succeeds it will either become large or it will be assimilated by a larger organisation. Growth will lead to clear labour division and the future employees will be the ones hired on the basis of standard skill set. How would employers evaluate your suitability of the traditional resume structure is too rigid to be used as a good measure? The answer is your online identity, your personal brand that is being created over the years through layers of interactions, contributions to discussions, publications, opinions and associations. This will trump the resume as an indicator of who you are. A perfect resume can be written in one day, but the identity takes a life time to build. Your online expressions are gradually painting a complete picture of you, a much more comprehensive description of your skills as a potential cast member in a creative project. Employers will use virtual identity that to evaluate your suitability. Is that scary? Maybe not, because of the variety of needs and circumstances, there will always be something out there that suits our personal expression and ability to solve problems in a creative way. What happens if you don’t have a public online identity? I suspect that over the next decades the answer to that question will be: you don’t exist.